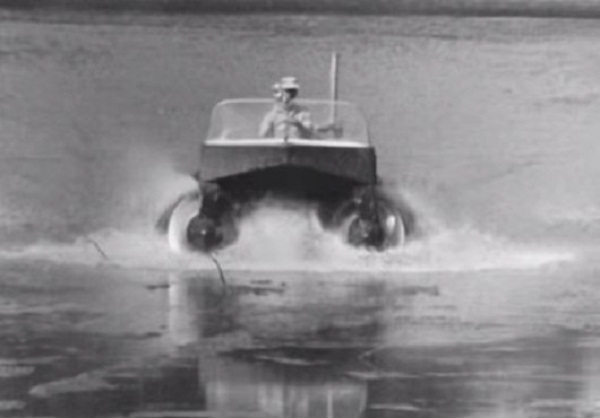 The amphibious vehicles take many decades in the minds of designers, as shown in the video above. It is an amphibious vehicle of the Chrysler 1960 is quite curious to see him move through the mud like that. In fact, I think that perhaps was ahead of its time. Said vehicle only is this video, nothing more, but mentioned that he had an engine of 225 horsepower, which allowed him to move more or less efficient. As you can see, he was traveling through a pair of cylindrical hollow screws, which allowed him to move laterally. That if it was seen only by roadworthy places do not care much a disaster, because the screws on the surface leaving large grooves. Perhaps now it would place in the market as the vehicle for wetlands. In fact, I would not seem strange to see him as the rescue vehicle. This conceptual development never saw commercial production. No information as to what was the problem that relegated the market. It could be that maintenance was not nothing simple or nothing cheap, but it could also be that the idea was somewhat advanced for the decade we are talking about.